President Donald Trump of America was vindicated by his optimism prior to meeting the leader of North Korea. At first, Kim Jong-un, the leader of North Korea, looked anxious and a little overawed by events but he soon responded in a positive manner. 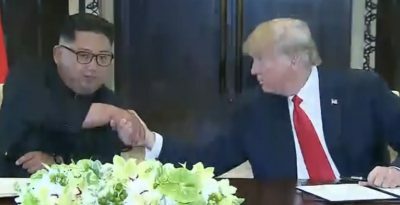 Hence, after the meeting took place between Trump and Kim, it became apparent that both sides had laid a firm foundation to start serious work. Of course, the road ahead remains rocky because individuals in both camps may worry about trusting the opposing side. Equally, if military maneuvers by America and South Korea appear too aggressive to North Korea – or, if North Korea modernizes its military prowess by an unexpected launch, then events could quickly unravel in a negative sense. Therefore, it is essential that America and North Korea – along with South Korea and China – take steps to strengthen the foundation to a higher degree. Also, all the above-named nations need to take into account the concerns of Japan and the Russian Federation, even if both nations are minor players in comparison to America, China, North Korea, and South Korea respectively. In other words, a comprehensive alignment is needed in the long-term between all nations that share the geopolitical space of Northeast Asia along with the power dynamics of America. Japan, for its part, remains sidelined by history and because of the dominating role of America in the geopolitical dynamics of Japan. This equally applies to America having military bases in various parts of the country. Therefore, the nations of China, North Korea, and the Russian Federation respectively all distrust Japan to certain degrees and don’t view this nation to be fully independent. While this is a side issue for events that took place between America and North Korea – it is an issue that Japan must address if this nation wants to be taken seriously in Northeast Asia and further afield. Turning back to the meeting between America and North Korea then obviously the stage is being set for greater interaction between both nations. Of course, many obstacles remain but Trump was extremely upbeat. Overall, sanctions will remain on North Korea but the meeting between Trump and Kim promises to create a new positive nuance on the Korean Peninsula. If so, this will have reverberations throughout Northeast Asia. Hence, Japan must acknowledge the changing dynamics and think long and hard about why this nation is being sidelined. It is hoped that China and South Korea will guide events between America and North Korea when stumbling blocks emerge. Therefore, while opportunities abound for all sides, it is still clear that the path ahead remains rocky. In saying this, at least the first major stones have been overcome and this says much for the leaders of America and North Korea when it comes to this extremely serious issue.